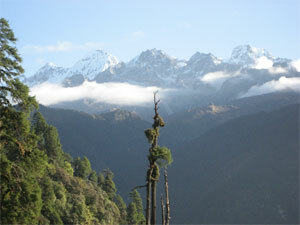 The first scientific land use survey in Sikkim was carried out from 1950 to 1958. The second was carried out some 26 years ago from 1976 to 1983. The objective of the subcomponent is to develop land use topo maps to be used for the conservation of biodiversity by updating the existing map sheets. These topo maps will be made by extracting information from satellite imaginaries and through ground truthing. The maps will assist planners and decision-makers, including government agencies, donors, and private entities, not only in land use and biodiversity conservation but also in development planning. A main laboratory for GIS and remote sensing (RS) will be established at headquarter of the Forest Department. The main laboratory will have, at least, a senior forest official as the head and two fully-trained forest personnel. The branch GIS offices in the three divisions and the 27 range offices will also be established for the application and utilization of the spatial information base in the day-to-day activities of forest officers. This information base network, in combination with in-house communication network, will increase the efficiency and effectiveness of the Forest Department?s public service delivery despite its budgetary and human resource constraints. The main laboratory will develop, accumulate, modify, and disseminate information for the information base. On the other hand, DFOs, ROs, BOs, and/or information clerks at the branch offices will add and overlay field-collected data by using geographical positioning system (GPS) equipment to record, visualize, analyze, monitor, and report status of their field activities. Field data will be sent to the main laboratory where the data will be consolidated to represent the state-wide status of forest and biodiversity management. The main output of this subcomponent will be a new digital database on land use in Sikkim and an up-to-date forest cover assessment completed through effective data collection procedures at the district and range levels. An A-0 size scanner and an A-0 size plotter, personal computers, and colour laser printers will be procured to equip the main laboratory and the branch GIS offices. Software licences such as Erdas Imagine, ArcInfo, ArcView GIS, and other supporting software and operating systems will be purchased. Data will be prepared on the following: digital elevation contour lines, administrative and cadastral boundaries, forest management and protected area zonation including division, range, block, and compartment borders, locations of forest and protected area management facilities, and other natural and socioeconomic features of Sikkim. However, GIS information of the areas such as border areas under strict military control is not able to obtain, and must be excluded from the information base. Analysis and interpretation of high resolution satellite images of MX-4 P-6, Cartosat, and Quick Bird will be conducted. Thematic information will be extracted to create maps on vegetation types, forest resources, land use, human intervention assessment, landslide assessment, biodiversity assessment, tourism and ecotourism for use by the government and the private sector. This task will be preferrably carried out through in-house arrangement within Forest Department. However, private sector support may be sought if require. Two forest officers who will maintain the main GIS/RS laboratory will be trained for ten (10) months. In addition, 54 officers including ROs and BOs from 27 ranges will be trained on the use of GIS and remote sensing software and on the use of GPS and datasets for 15 days at the Indian Institute of Remote Sensing at Dehradun or other appropriate institutes. All training activities will be outsourced.